Three wines from the winery were awarded in the Vinalies contest in France. They competed with more than a thousand samples from the orb. The wines Esther Ortiz, Tannat Único and Trivarietal de Campos de Solana [Solarium Fields] were awarded, each one, with the gold medal in the Vinalies International contest in France, one of the most prestigious worldwide. More than 1,000 samples from 55 countries participated in this event, which has been organized for 25 years, according to a press release. “It is a recognition that makes us proud. For the wine industry, the Vinalies International competition is one of the most important references on a global level,” said Luis Pablo Granier, general manager of Sociedad Agroindustrial del Valle (SAIV). “The award motivates us and reaffirms our commitment to provide Bolivians with wines of the highest quality,” added the businessman. Vinalies International is the contest organized in Paris by the Union of Oenologists of France. This year’s event was five days, from March 1 to 5. At the event, experts from France and other countries came together to blindly taste wines from around the world. In this latest version of the contest participated 1,002 samples organized by variety and origin. 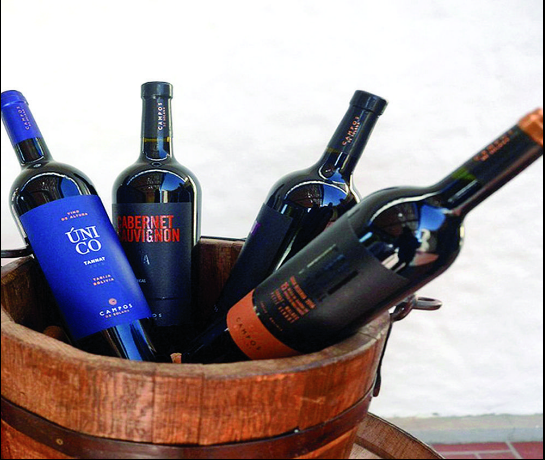 Among the winning wines is the Trivarietal de Campos de Solana that has been conceived to fuse the structure of tannat, the juiciness of malbec and the complexity of petit verdot. Each year, Nelson Sfarcich, winemaker of this winery, chooses the three best plots of the harvest of grapes, to achieve the quality of this wine, which to date has obtained 12 awards, becoming the most awarded wine of Bolivia at the international level . The second award-winning wine, Tannat Único, has the prestige of being the first Bolivian wine to obtain a Platinum Medal in the Decanter of 2016 as “Best Tinto in Central and South America.” Now add this gold in Vinalies and is emerging as the new symbol of Bolivian viticulture. It is an intense varietal red, with a scent of black fruits and lavender, a powerful taste and a balanced finish. For its part, Esther Ortiz, the wine created in tribute to the wife of Don Lucho, founder of the winery, is the premium wine of Campos de Solana. With an elegant and fresh taste, it has 24 months of aging in French oak barrels. It has been the winner of the first gold medal for Bolivia, in the prestigious World contest in Brussels in 2017. “Each medal or recognition is a source of pride for the Bolivian industry, because it ratifies the optimum quality of the wines produced in the country and puts Bolivia on the wine world map,” he concluded. Campos de Solana has the highest number of medals in Bolivia. The winery was born in 2000, with the vision of producing the most refined wines of the Tarija Valley, combining avant-garde with family wine tradition, both in terms of human resources and technology. The vineyards are located more than 1,850 meters high.